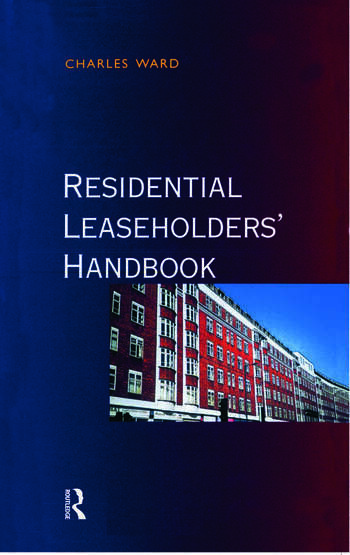 The Residential Leaseholders’ Handbook explains in plain language everything leaseholders and their advisers need to know in relation to long residential leases. Among the common problems it tackles are absent landlords; spiralling service charges; the right to be consulted on significant or long term service charge items; how to challenge excessive charges; how to gain control from difficult or exploitive landlords and how to set up a management company. The book begins with the legal framework of a typical ground lease and its main provisions including: responsibility for repairs, insurance and management of a building, the meaning of the covenant for "quiet enjoyment" and the termination of a lease due to overdue rent. The author explains what lenders look for in a residential lease; how leaseholders can insist that their lease is amended to meet lenders’ requirements and the issues relating to assignment, subletting and alteration of leasehold premises. Extensive use of real life scenarios, landmark cases and some fictitious case studies illustrate how leasehold law works in practice and enables readers to effectively assess their position. Written in non-technical language this book is a reliable source for leasehold management companies, managing agents, legal advisers, students and residential leaseholders.